iPhone owners holding out hope that OS 3.2 would bring some of these fancy new iPad spoils to their devices might be in for a disappointment, because two of the big ones -- split view and popovers -- are both referred to in Apple's updated human interface guidelines as "iPad-only." Realistically, this shouldn't come as a surprise; both of these UI elements were built to shine on larger displays, and it's hard to say how you could make either one of them work on HVGA -- but it's important for devs to note that heavily investing in these are definitely going to make it difficult to make their apps compatible across all iPhone OS-powered devices. Considering that iPhones will almost certainly continue to dominate iPads for sales volume, we know how we'd be developing. In other news, running the updated iPhone simulator in iPad mode gives you the option to take photos, which doesn't make a heck of a lot of sense considering that it doesn't have a camera. There are plenty of plausible explanations for the muck-up, but our guess is that Apple's left the vestigial capability on-board since the framework's already in place for the iPhone and there could very well be iPads down the road that have a cam (or two). 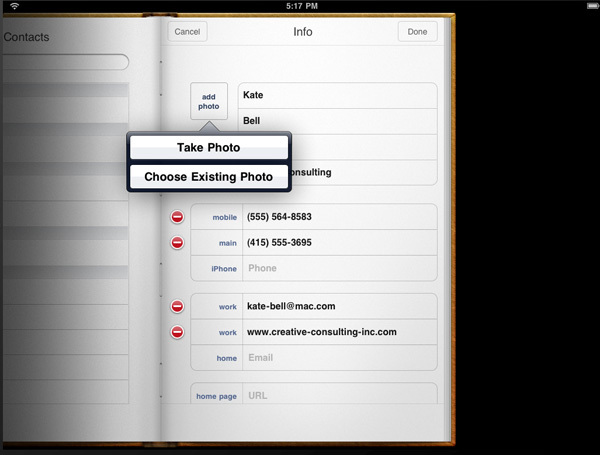 Follow the break for a shot of the iPad's Address Book imploring you to take a photo -- and savor it, since it's probably the closest you'll actually get to snapping a shot on the device any time soon.